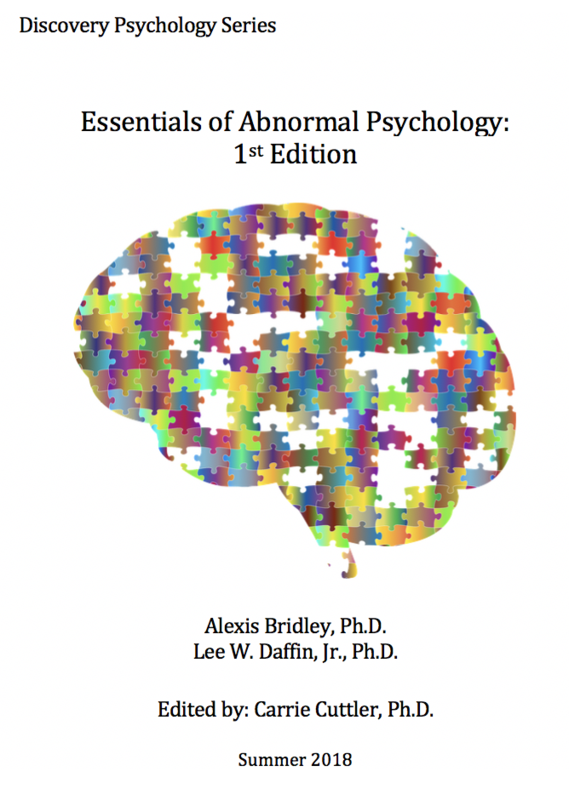 Alexis Bridley and Lee W. Daffin Jr.
Abnormal Psychology is an Open Education Resource written by Alexis Bridley, Ph.D. and Lee W. Daffin Jr., Ph.D. and Edited by Carrie Cuttler, Ph.D. through Washington State University. It tackles the difficult topic of psychological disorders in 8 chapters. After the first three foundational chapters, a discussion of psychological disorders ensues to include anxiety disorders, obsessive-compulsive and related disorders, mood disorders, schizophrenia spectrum and other psychotic disorders, and personality disorders. Chapter 1: What is Abnormal Psychology? 1.1.3. What is the Cost of Mental Illness to Society? 3.1.1. What is Clinical Assessment? Abnormal Psychology is an Open Education Resource written by Alexis Bridley, Ph.D. and Lee W. Daffin Jr., Ph.D. and edited by Carrie Cuttler, Ph.D. through Washington State University. The book tackles the difficult topic of psychological disorders in 8 chapters. This journey starts by discussing what abnormal behavior is and how psychological disorders are defined. Models of abnormal psychology and clinical assessment, diagnosis, and treatment are then discussed. With these three modules completed, the authors next explore some of the most common psychological disorders including anxiety disorders, obsessive-compulsive and related disorders, mood disorders, schizophrenia spectrum and other psychotic disorders and personality disorders. Each disorder is covered by discussing its clinical presentation, epidemiology, comorbidity, etiology, and treatment options. Essentials of Abnormal Psychology by Washington State University is licensed under a Creative Commons Attribution-NonCommercial-ShareAlike 4.0 International License, except where otherwise noted. Additional languages available: Bahasa Indonesia, Deutsch, français, hrvatski, italiano, Nederlands, norsk, polski, suomeksi, svenska, te reo Māori, Türkçe, русский, українська, العربية, 日本語. Please read the FAQ for more information about official translations.